“William Bruce, one of the best known artists of the city died this morning at the City Hospital after a brief illness from Bright’s disease and heart failure. The deceased had been confined to his bed but one week but yesterday his condition became so serious that he was taken to the hospital. Mr. Bruce, or “Billy” as he was known among his friends, was born in Auburn. He lived here all his life with the exception of periods spent in art study in New York and Europe. Years ago he was an exceptional painter of portraits but in later years devoted a good share of his time to painting animals. 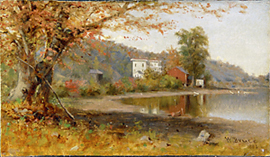 He was especially fine in his paintings of dogs and many of his works adorn Auburn homes as well as homes in other cities. Some of his works were used by calendar firms for distribution all over the world. 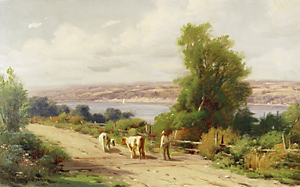 Bruce’s landscapes are very similar to Clough’s and W.H. Yates who both taught painting. Bruce must have been one of their best students. He kept Irish Setters and painted them often and many of his portraits of dogs were published in calendars at the turn of the Century. 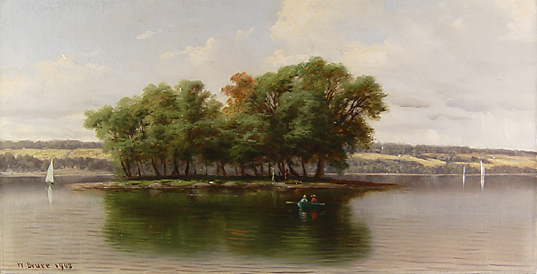 The Cayuga County Museum of History and Art has several of his paintings in their collection.